A college education can pay off in many ways, including better jobs, higher earnings, and lower unemployment. However, with U.S. student loan debt exceeding $1 trillion, and the average debt per borrower surpassing $25,000, the price for attaining a college degree is steep. Student loan debt is the only form of consumer debt that has risen since 2007. A report published by the Federal Reserve Bank of New York shows that student loan debt has doubled since the recession and between 2004 and 2012 it nearly tripled—growing from $364 billion to $966 billion. During that same time period, the number of borrowers jumped from 23 million to 39 million. Several factors have contributed to this extreme debt growth, including the ever-rising price of college tuitions, the deep recession, and the overall demand for higher education. But no matter the reasons behind it, student loan debt is a growing concern for students, their parents, and the economy as a whole. Some students and their parents end up taking on too much debt and may struggle to make the payments. Debt can be a burden for students who are beginning their careers, causing them to delay buying a car or a home. Parents who should be saving for their retirement may delay doing so, and can also have difficulty paying down their share of their children's student loan debt. A college education is an investment that can pay off for years to come. In fact, researchers from the Bank of New York determined the rate of return for a college degree to be about 14% to 15%. They took into account 2 key factors: the cost of an undergraduate education and the wages college graduates can expect to earn relative to the wages of high school graduates, until they retire around age 65. Although all workers have seen a downturn in wages overs the last decade, college graduates have suffered less than workers with just a high school diploma. Workers with a 4-year college degree make an average of 75% more than high school graduates. Over a lifetime of working that difference could add up to $1 million more in earnings. Having a 4-year degree also means less time out of work, as the jobless rate for college graduates was less than half (4.2%) that of high school graduates (8.9%). A college degree may be worth the price, but it's still generally better for families to minimize the amount of debt they take on. A good strategy to avoid crushing student loan debt is to save for college and to start doing so as early as possible. You probably won't be able to save the entire amount needed to pay for college, but every dollar you do save will be less that you'll have to borrow (and pay back with interest). Money saved instead of borrowed means that your child or grandchild can graduate from college with a future that hopefully doesn't include unmanageable debt. *Assumes a 6% earnings rate for savings, a 7% interest rate, and a 10-year repayment period for the loan. Sources: Federal Reserve Bank of New York, "Measuring Student Debt and Its Performance" and "Do the Benefits of College Still Outweigh the Costs? 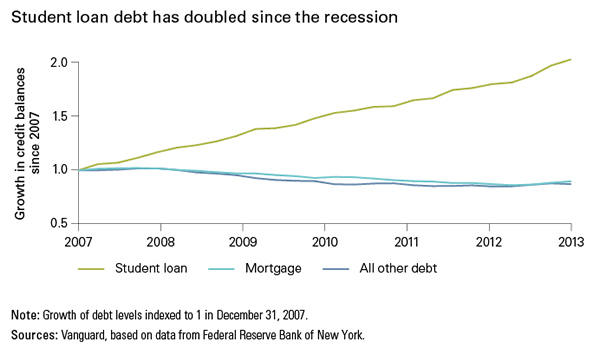 "; Vanguard, "No bubble to burst: U.S. student debt is not housing," 2014.